Last weekend I went to the Sculptors Society Annual Party, I enjoyed talking to fellow artist and sharing ideas, we were agreed of keeping and loving our first sculpture to either notice how good we are now or just giving us a nice memory. 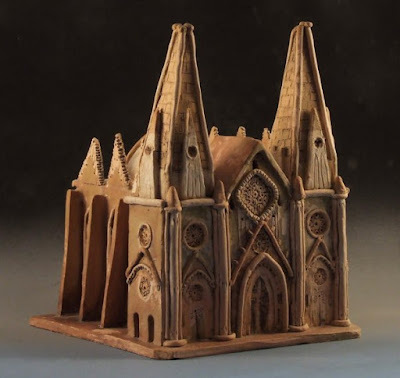 I made this church (5"x6"x7") in terracotta when I was about 10-years-old it toke me a full week to finish it, I love churches I think they have a good energy and give you peace. Quize compartir mi primera escultura, la realize cuando tenia mas o menos 10 anos y me tomo una semana terminarla. Es mi tesoro mas preciado. Have a great Christmas Sikiu and a wonderfully happy 2009.